I’m not going to lie, colour correction baffled me for a long time. I never even knew you could do such things with make-up correction and never did include it in my own routine. Then I started watching lots of YouTube videos as you do and really saw how it was able to make a difference. When I was researching colour correction I suffered from redness around my nose, which Murad skincare then helped clear up/keep at bay so now my main concern is more dark circles. Colour correction is actually based on the practice of the colour wheel, think back to school days. 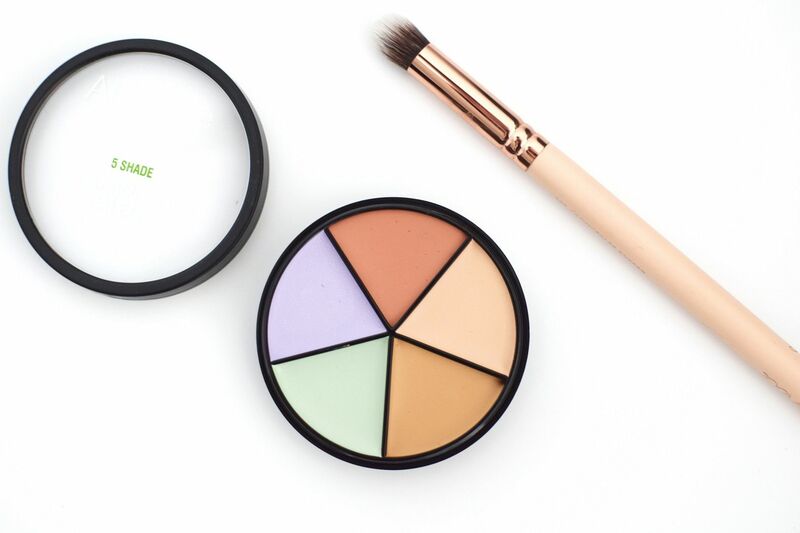 For colour correction all you need is a colour wheel, I’m using Airbase corrector palette and a Zoeva concealer brush, plus a handy guide on what you are looking to cover. This is probably the most common colour correction problem. For dark circles look to use an orange or peach shade from the colour correction palette. This balances out the dark shades in your skin tone and then cover with concealer and/or foundation. For darker skin tones go for orange and lighter a peach colour. I did a video on dark circle colour correction which you can watch here. Green tones are what you need to be using to cover any redness you may have on your face. Green is opposite red on the colour wheel and so neutralizes it. The green calms the redness and covers it up so well – trust me. Again then follow with your concealer, foundation or powder. Slightly different to dark circles, dark spots on your face from discolouration or melasma can be covered with a red, orange and peach tones pictured in the palette above. It baffled me what the purple was for, but it is used to counteract dull skin. If you are fair a pink colour corrector can work better, whereas darker skin can get away with a purple or orange tone. It will eliminate any unwanted yellow undertones. To remove yellow tones completely from your face look for a purple primer. Most palettes come with a concealer shade too as seen here, but feel free to use whatever one you find right for you. Previous ArticleWhich Giorgio Armani Foundation Is Right For You?